Welcome to another installment of a segment where we dive into one Elder Scrolls Online’s many Sets, and explore what sort of Builds you can make. Not only will we show you how to get the most from these Sets, but we’ll explain where to get them, what requirements there are to obtain them (if any), and everything else you could possibly want to know about them. In this article we will take a look at the Alessian Order Set that increases Health Recovery based on your Resistances. This set was added with Update 1: Craglorn which launched in May 2014. This addition to the base game featured the inclusion of the games first Trials in Hel Ra Citadel and Aetherian Archive. The Alessian Order set can be obtained from the Vlastarus Elite Gear Vendor in Cyrodiil. 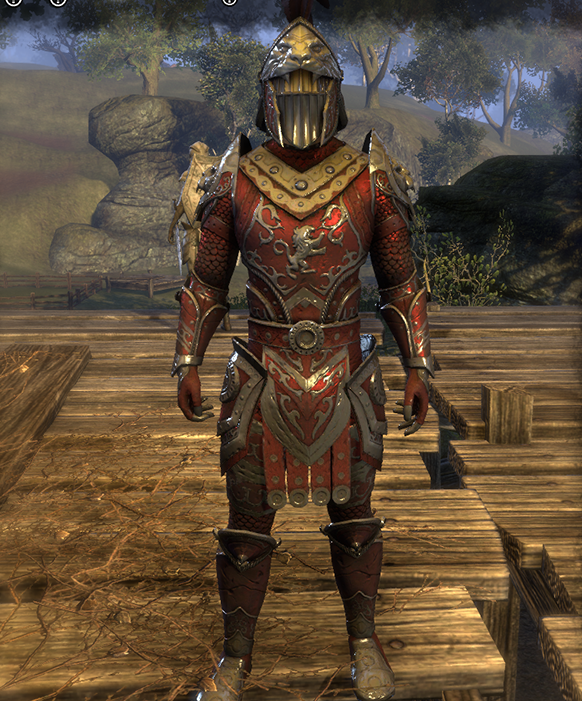 This Heavy Armor set comes in Aldmeri, Daggerfall and Ebonheart Motif Styles. These motifs are tied to your chosen faction and can be found in chests in Cyrodiil and Imperial City. Only players belonging to that faction can find these, so players from other factions will need to purchase them from guild traders or other players. Weapon and Armor Traits are random, meaning you are likely going to have to farm pieces for different Traits. This is a Heavy Set so enchantments on Armor and Weapon pieces are Max Health and Absorb Health. Jewelry comes with the Healthy Trait and Health Recovery Enchantments. Keep in mind that you can use Transmutation to change Traits if you wish, however the Summerset expansion is needed to change Traits on Jewelry, along with 50 Transmute Crystals. 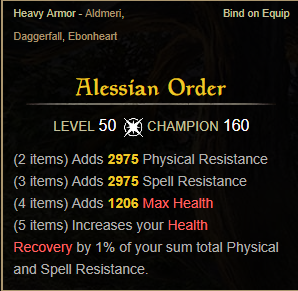 Alessian Order adds 2975 Physical/Spell Resistance and 1206 Max Health with 4 Legendary pieces equipped. The 5 piece bonus increases Health Recovery by 1% of your total Physical and Spell Resistance. Health, Stamina and Magicka are all complimented with same named Recovery stat. This stat indicates how much of that particular resource you can regain over time. Recovery ticks every 2 seconds and the amount you recover is displayed in the character sheet. Base recovery (without anything that would increase it further) depends on your character’s level. These Recovery stats can be increased in many ways. Note that increasing Max Health, Stamina and Magicka does not affect Recovery at all. Every Recovery stat has its own methods of how to increase it. It can be through Champion Skills, Sets, Abilities, Buffs, Traits…etc. Set Jewelry almost always comes with a Recovery stat Enchantment. 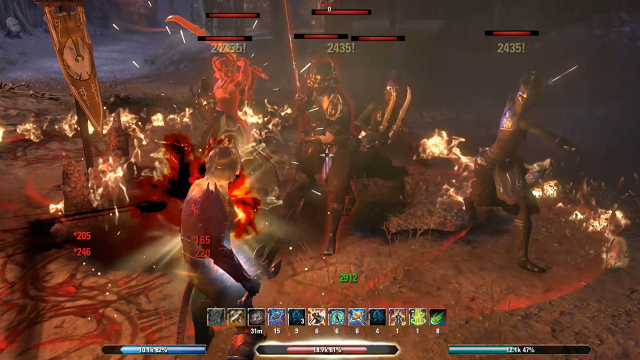 Light Sets come with Magicka Recovery, Medium with Stamina, and Heavy with Health. The Invigorating Amor Trait increases Recovery for all 3 resources at once, though by a very low amount. Racial Passives: Khajiit have passive that increases Health Recovery by 100. Sets: A number of sets, mostly Heavy ones, have Health Recovery that goes up to 129 at Legendary quality and CP 160. Some Sets take it further and focus almost exclusively on raising Health Recovery and restoring Health in some other ways. These sets are Willow’s Path, Beekeeper’s Gear, Orgnum’s Scales, Green Pact and Permafrost. Glyph of Health Recovery: Jewelry Glyph that increases Health Recovery by 169 at most. The Steed Mundus Stone: Increases Health Recovery by 363 if you have 7 Legendary Divine Traits. Minor/Major Fortitude Buff: Minor increases Health Recovery by 10% while Major increases by 20%. This buff comes from abilities, passives and Health Potions. 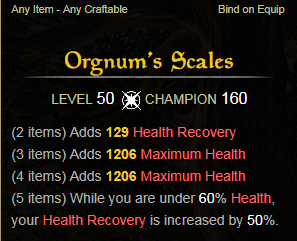 Healthy Champion Skill: Increases Health Recovery by 15% while at highest level. Racial Passives: Khajiit, Bosmer and Redguard have passives that increases Stamina Recovery. Sets: A number of sets, mostly Medium ones, have Stamina Recovery stat that goes up to 129 at Legendary quality and CP 160. Some Sets take it further and focus almost exclusively on raising Stamina Recovery and restoring Stamina in some other ways. These sets are Willow’s Path, Ulfnor’s Favor, Battlefield Acrobat, Bone Pirate’s Tatters, Hircine’s Veneer, Marksman’s Crest and Trappings of Invigoration. Glyph of Stamina Recovery: Jewelry Glyph that increases Stamina Recovery by 169 at most. The Serpent Mundus Stone: Increases Stamina Recovery by 363 at most if you have 7 Legendary Divine Traits. Minor/Major Endurance Buff: Minor increases Stamina Recovery by 10% while Major increases by 20%. This buff comes from abilities, passives and Health Potions. Mooncalf Champion Skill: Increases Stamina Recovery by 15% while at highest level. Racial Passives: Breton and Khajiit are the only Races that have a passive which increases Magicka Recovery. Sets: A number of sets, mostly Light ones, have Magicka Recovery stat that goes up to 129 at Legendary quality and CP 160. 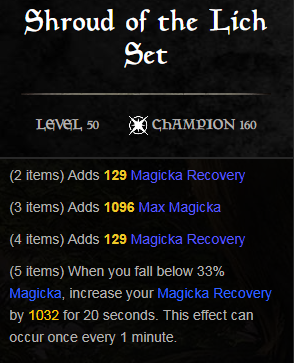 Some sets take it further and focus almost exclusively on raising Magicka Recovery and restoring Magicka in some other ways. These sets are Arch-Mage, Bright-Throat’s Boast, Moondancer, Robes of Alteration Mastery, Shroud of the Lich and Vestments of the Warlock. Glyph of Magicka Recovery: Jewelry Glyph that increases Magicka Recovery by 169 at most. The Atronach Mundus Stone: Increases Magicka Recovery by 363 at most if you have 7 Legendary Divine Traits. Minor/Major Intellect Buff: Minor increases Magicka Recovery by 10% while Major increases by 20%. This buff comes from abilities, passives and Health Potions. 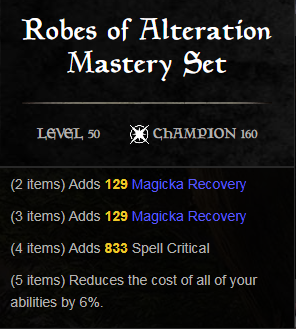 Arcanist Champion Skill: Increases Magicka Recovery by 15% while at highest level. 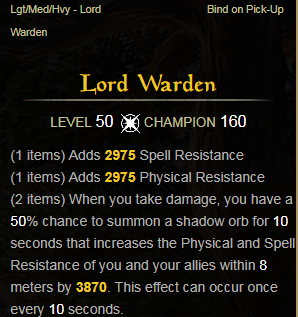 This Set on its own adds 2975 Physical and Spell Resistance which is a nice defensive boost. Scaling is linear and there are no ways to increase it. By having more Resistances you can have more Health Recovery, and any increase that goes over the Resistance hard cap (33k) will add additional Health Recovery. So it can get up to almost 900 Health Recovery in extreme cases. 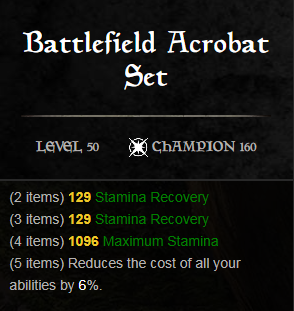 Total Health Recovery bonus can be seen on the Set’s tooltip beneath the 5 piece set bonus. By using the Protective Trait on Jewelry and Defending on your Weapon you can get around 13k total Resistance on a max level character which equals around 130 Health Recovery. Jewelry already adds up to 169 Health Recovery per piece if it is part of Heavy Set. Adding the Steed Mundus Stone with 7 Divines will also add around 360 Health Recovery. Werewolf adds 20,000 total Resistance to the player when in Werewolf form, which = 200 Health Recovery. Alessian Order is a set purely for Tanks because they are the only ones that truly need Health Recovery, Max Health and Resistance bonuses. Hitting about 25k Physical and Spell Resistance should not be an issue at higher levels for a proper tank, which would mean 500 Health Recovery from the set, and that is not bad at all. 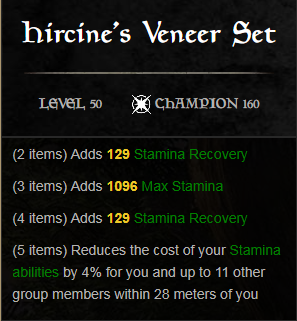 The only issue is that Tanks require some Stamina bonuses, which this set does not provide. That is why the Tower Mundus Stone would be good choice instead of The Steed to balance it all out. Going overboard with Resistance can make you immortal in lots of situations but your group will suffer for it. In total my Resistance sum was around 87k which means 870 Health Recovery from Alessian Order. At its highest level it ended up around 4700 Health Recovery. That is quite a lot. If the buff from the Troll King Monster Helm is active then Health Recovery goes up to around 6200 for 10 seconds. Lord Warden to increase resistance of whole party. It raises your resistance as well for 10 secs, meaning more health recovery when it is active (up to 76 more). 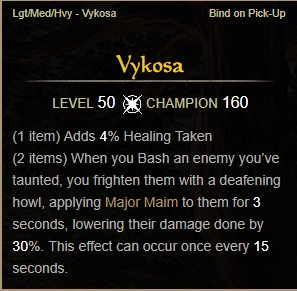 Vykosa to put Major Maim on an enemy for couple of seconds, reducing damage dealt by 30%. Engine Guardian to add 129 Health Recovery and random resource restoration which helps a lot in keeping you alive. There are many options for a second set. Depending on the class I would opt for those that can provide beneficial effects to the whole party or a direct support set. Something like Ebon Armory to provide more health to teammates, Akaviri Dragonguard to reduce Ultimate cost, Champion of the Hist to get more stamina and permanent Minor Heroism, the newly added Mighty Glacier that provides teammates with Major Ward and Resolve upon hitting an enemy with a Snare or Immobilization ability, Automated Defense that provides teammates with Major Aegis when Ultimate is used… and there are many more sets that would fit nicely. Health Recovery is a better stat in PvP than in PvE due to healing and damage being halved, so characters with high Recovery and good defense can survive for long periods of time. Going over the Resistance cap is not uncommon in PvP because DPS roles have a high amount of Physical or Spell Penetration. That plays right into the hands of the Alessian Order set because more Resistance equals more Health Recovery. However, Health Recovery is now countered by the Defile debuff, which is something you need to be aware off. It is commonly used in PvP so having high Health Recovery does not mean you are automatically really hard to kill. Damage Shields and debuff removal abilities are good to have in that case. This set relegates you into a Tank role in PvP as well with the goal of harassing enemies and drawing fire, basically keeping enemy attention on yourself when possible. 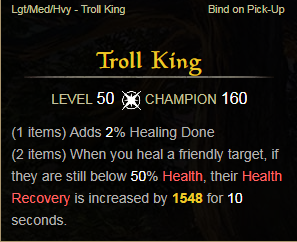 Troll King is the best choice for a Monster Set, but only if you have a means of healing yourself to proc it. 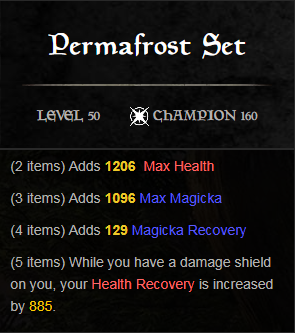 Permafrost works great as well since it increases recovery by 885 when a Damage Shield is active. 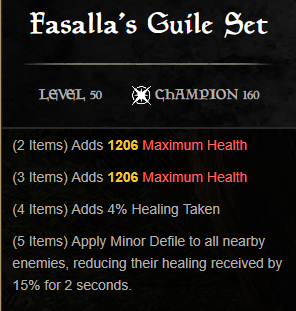 Fasalla’s Guile puts Minor Defile on all nearby enemies, making it a great debuffing choice for PvP players. Werewolf players gain an additional 20,000 Resistance on top of what you already have, so you will gain an additional 200 Health Recovery when transformed. This means you can reach staggering Health Recovery and have 40k + Resistances as a Werewolf, making you virtually invincible if you can cleanse Defiling effects. Alessian Order is a set with good tanking bonuses, and pretty much everything you would want except Stamina bonus. It provides a good amount of Health Recovery that comes from an already useful Resistance stat. That makes it one of the best Health Recovery sets in the game. 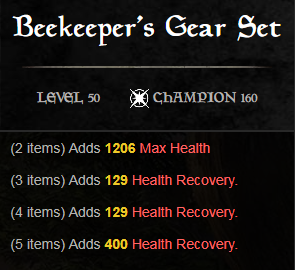 You essentially get the same Health Recovery as Beekeeper if you are setup for tanking, but with an extra 2975 to your Resistances. Using the Tower Mundus Stone solves the problem of the no Max Stamina set bonus. Going full on Health Recovery is never worth it so the quality of such set is best shown in how much it can offer in a realistic build scenario. At max level with Heavy Armor equipped and no further bonuses to Resistance, you get around 14-17k Spell and Physical Resistance which is already 280-340 Health Recovery without needing to optimize anything. The set provides an additional 3k Physical and Spell Resistance which you need anyway for end game content. From 25k to 30k is good enough for PvE, so equipping support sets next to this selfish one is the way to go. With a realistic setup such as Battalion Defender – Alessian Order – Engine Guardian you can still achieve over 2k Health Recovery easily without wasting Champion Points and having to go over the Resistance cap. Taking that all into consideration, it still does not make this set a great choice, but rather a decent one because being one shot in PvE is quite normal if you miss a Block, and that is where Health Recovery won’t have any effect (Resistance bonuses from this set might, although only slightly). In PvP this set is will be used by niche players who try to make “Immortal” Builds, due to the high amount of Health Recovery you can obtain, combined with the fact you can go over the 33100 cap because of Penetration. There are more options to play with here since getting one shot is highly unlikely, especially with decent defenses added on top of Health Recovery. Overall Alessian Order is a decent choice for PvE because of the Resistance and Health Recovery correlation, and decent set for PvP when built around it. So this set will be used in game most definitely, although not as frequently anymore because of the Health Recovery nerf to Racial Passives. Only Khajiit can have up to 100 Health Recovery from their passives at the time of testing this. Stay tuned as I’ll be covering more ESO Sets, and be sure to check out our Wrathstone Breakdown article, as well as the Future of ESO!